The Indiana State Library is proud to announce the newest digital collection available through Indiana Memory, the Indianapolis Brewing Company photograph album. The collection contains 66 photographs of the C. F. Schmidt brewing plant, one of three plants owned by the Indianapolis Brewing Company. The photographs, taken sometime in the early twentieth century, depict the exterior and interior of the brewing plant, and also includes several photographs of brewing equipment. 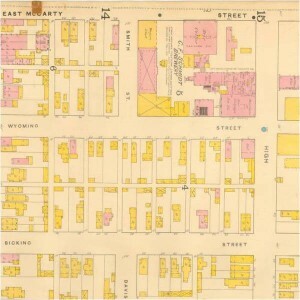 The brewery was located at the corner of McCarty and High St. where the present day Lilly Corporate Center is located. 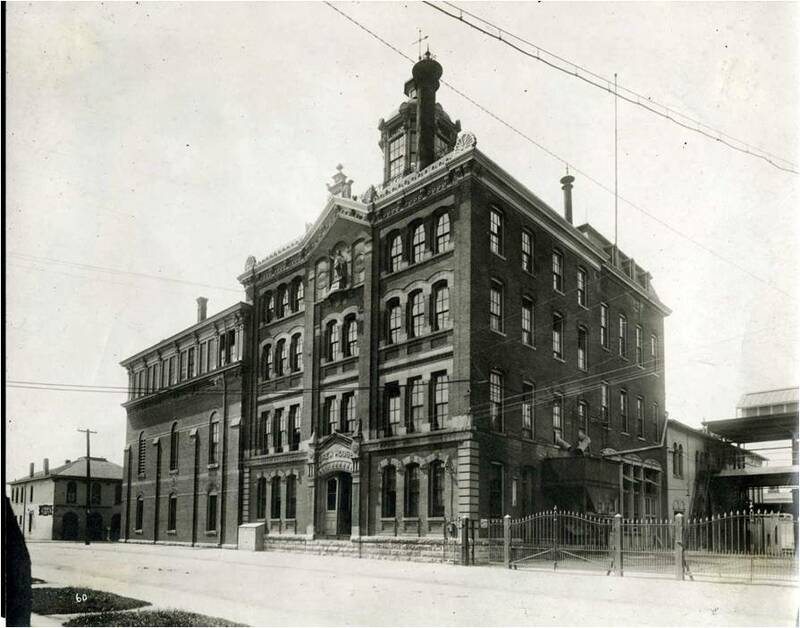 The original brewing plant was founded by Christian Frederick Schmidt and Charles Jaeger in 1858. 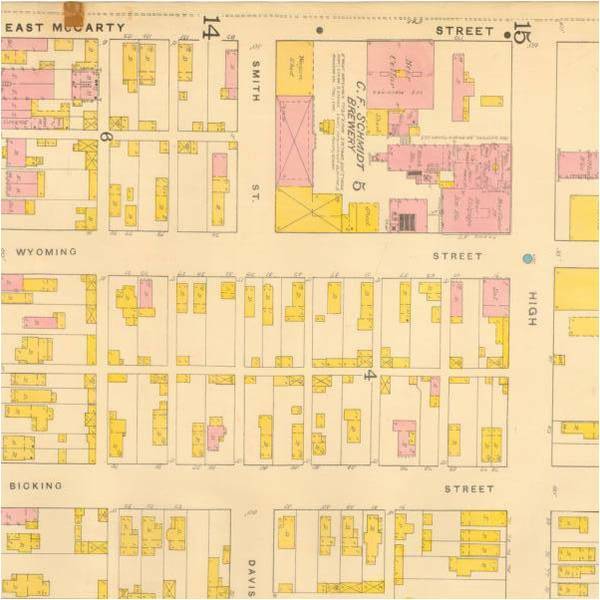 The duo owned and operated the brewery until 1889, when the plant merged with two other local brewing plants to form the Indianapolis Brewing Company. The Schmidt brewery brands included a Bock, Budweiser, Cream Ale, Dublin Porter, Stock Ale, and Tonica. The brewery grew in popularity for their ability to produce a bottom-fermented lager that closer resembled European beers more familiar to Hoosiers than the strong ales made from baking yeast that was common for the period. The Indianapolis Brewing Company, founded in 1887, was the largest Indiana based brewery. The brewery was comprised of three separate brewing plants, the P. Lieber Brewing Company City Brewery, the Casper Maus Brewery, and the C.F. Schmidt Brewing Company. The Indianapolis Brewing Company won medals for its Duesseldorfer beer at the Paris Exposition of 1900, the St. Louis World’s Fair in 1904, and at Liege, Belgium in 1906. In 1918, the state of Indiana instituted Prohibition, forcing the Indianapolis Brewing Company to begin producing non-alcoholic beverages and tonics. The C.F. Schmidt plant of the Indianapolis Brewing Company ceased operations May 27, 1920, after 70 years of brewing. Be sure to continually visit Indiana Memory, http://digital.library.in.gov, to find the latest digital collections published by the Indiana State Library. The Indiana State Library, through Indiana Memory, continues to produce digital collections highlighting the library’s rich and varied collections. 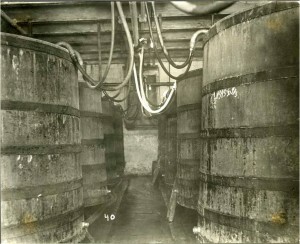 The Indianapolis Brewing Company photograph collection is located within the Indiana State Library Rare Books and Manuscripts Division Photograph Collections, http://cdm16066.contentdm.oclc.org/cdm/landingpage/collection/p16066coll13. 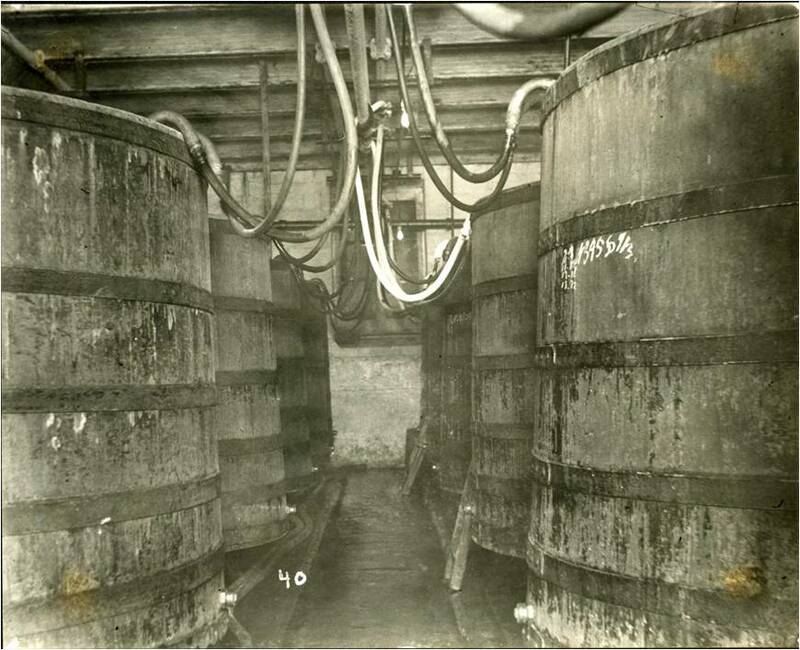 Take a minute to enjoy a unique behind the scenes view of a pre-Prohibition era brewery! This blog post was written by Brent Abercrombie, Rare Books & Manuscripts Librarian, Indiana State Library. For more information, contact the Indiana State Library at (317)232-3678 or “Ask-A-Librarian” at http://www.in.gov/library/ask.htm. This entry was posted in Rare Books & Manuscripts and tagged Beer, Indiana, Indiana State Library, Indianapolis, Indianapolis Brewing Company, Rare Books & Manuscripts by indianastatelibrary. Bookmark the permalink. I feel I should have said more about how to navigate the digital Photographs Collection on Indiana Memory. The Indianapolis Brewing Company photographs are displayed along with another photograph collection, the Legislature Albums. To search just for the brewery photographs, you need to use the search field. Typing Indianapolis Brewing Company into the search field will limit your results to just the brewery photographs.